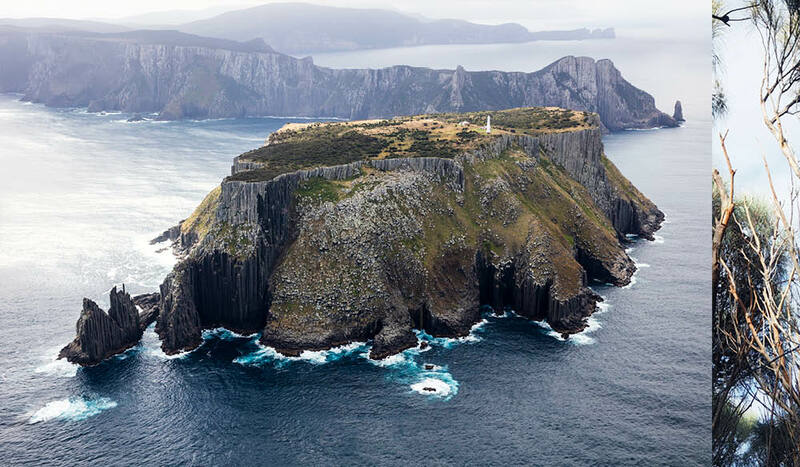 An aerial view of Tasman Island and its lighthouse, which sits off the tip of Cape Pillar (photo: Sean Scott). A taste of bushwalking in the Tasmanian wilderness, without the hard schlep: a Three Capes and Tasman Peninsula trek leaves us primed for more. From medieval bell towers in Europe to remote mountainsides in Mongolia; there’s always someone, somewhere, climbing something. And to what end? It’s a quandary that hits at the foot of another steep ascent. So far, the Cape Hauy track has felt like a punishing series of steps – up, down, up and round again like an Escher drawing – that have coincided with a late-in-the-game realisation that I’m really not much of a hiker. It’s lucky, then, that the Three Capes and Tasman Peninsula trip I’ve signed up to is fairly gentle in terms of Tasmanian hikes. A series of invigorating day walks, it’s a chance to dip in and out of the Three Capes Track: the four-day, 46-kilometre cliff-hugger that opened in December 2015 and has quickly become one of Australia’s essential coastal walks. Over three days, I’m exploring the best bits of the Tasman Peninsula – the small thumbnail of land that lies a little over an hour’s drive from Hobart to the south-east and, apart from its rugged good looks, is well-known for being home to the Port Arthur Historic Site. Along with 11 fellow hikers (mostly from all corners of Australia, plus a few travellers from overseas) and two guides, I’ll be walking through some of the most striking parts of the Tasman National Park coast. But rather than being an overnight hike, whereby you carry your sleeping bag and food on your back and spend nights in huts along the way, our base for two nights is the same comfortable B&B, we have a minibus to shuttle us between walks, and our third day isn’t really a walk – it’s a cruise. Which will suit this rookie fine; a fact that day one’s uphill challenges soon makes clear. We spend the first morning visiting Port Arthur before heading to nearby Fortescue Bay, where our guides Pip and Will prepare a picnic lunch. It’s a peaceful spot that marks the start of the day’s nine-kilometre loop, where bush fringes a crescent of sand and still water, and a Bennett’s wallaby says hello – lingering conspicuously while we eat. We pause for long enough to breathe in the air: that distinctively Tasmanian-grade oxygen that leaves eyes brighter and spirits higher. As we start winding our way towards the cape, the air becomes spiked with aromatics: a tessellation of eucalyptus, heath and pine. The sun beats down through the gaps it can find in the overstory and the track’s ups and downs reward with glimpses back to the shimmering bay, or dramatic views of the ancient coastline. 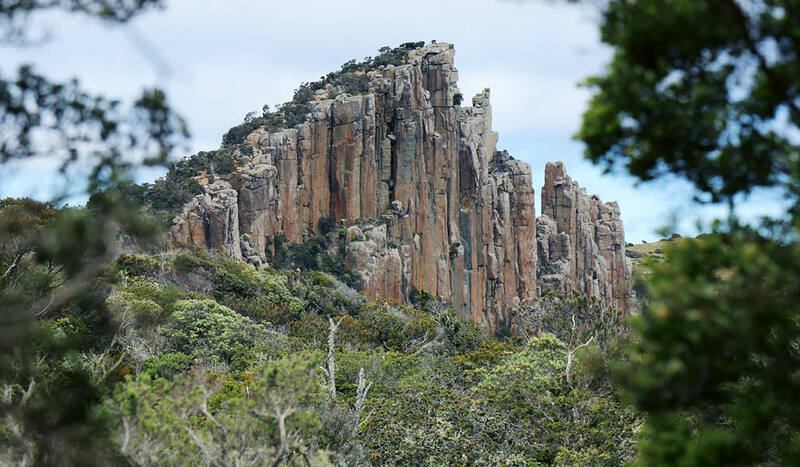 The 180 million-year-old dolerite columns and cliffs that characterise Cape Hauy and much of the Tasmanian landscape itself make this a popular area for climbing and abseiling. Upon reaching the cape we get vertigo simply from looking at the slender sea stacks that shoot from the ocean just metres from the cliff-edge: the so-called ‘Candlestick’ and ‘Totem Pole’ are catnip for daredevil climbers. Back at Fortescue Bay, we are shuttled to our home for the next two nights; a homey B&B with a large wraparound verandah overlooking the peaceful Little Norfolk Bay. With five guest bedrooms, a dining room and a cosy living room, it’s comfortable, inviting and a little quirky. In the morning, our resident hosts Lorella and Lynton cook a buffet breakfast in their big country kitchen: a hearty and delicious spread that includes cereals, breads, preserved and fresh fruit, soft boiled eggs and compotes made with fruit from their orchard garden. We make sandwiches and wraps from the ingredients our guides have prepared and tuck them into our daypacks ready for the walk ahead to Cape Raoul. Cape Raoul is one of the namesake ‘Three Capes’ – but as it is not yet linked to the official track (construction work is underway for this extension), walkers on the Three Capes Track can currently only view it from a distance. Which is a shame for them, because it’s gorgeous: a 14-kilometre round trip through tall stringybark forest, old she-oak woodland and coastal banksia scrub, with moments of great beauty and drama unfolding on the way. The first of these comes after a steady ascent: the bush falls away to reveal a panorama of primordial cliffs and Cape Raoul itself stretching out into the ocean. We sight world-renowned big wave surfing spot Shipstern Bluff and, not too far off on the horizon, Bruny Island. Walkers who venture here during spring and autumn might also spot migrating whales. A plateau daubed with coastal heaths and dwarf banksias – capped pink and yellow – marks a natural pause in the landscape and, while all is calm today, you’ll often find it surrendered to the intense winds that Cape Raoul is known for; some of the strongest in Australia have been recorded here. Our guides provide great lessons in both the Tasmanian bush and common sense: “shout out if you start to feel any hot spots on your feet”, Pip had said before we started out. Three hours in, I do, and she swiftly produces a bandage that prevents it from turning into a blister. The pair point out yellow-tailed black cockatoos and green rosellas, as well as edible and not-so edible bush foods: we taste mountain berries – bright pink, high in vitamin C and bittersweet – but leave the gleaming purple apple berries to dangle on their stalks. Conversations among the group inspire talk of other hikes in Australia and around the world: “The more you walk the more you discover how much there is to walk,” Pip says. We’re travelling with Tasmanian Expeditions, whose dynamic guides shepherd small groups of hikers on all manner of trails through the Tasmanian wilderness, including the more challenging Overland and South Coast tracks. Pip’s time is split between guiding walks and kayaking tours, while Will is also a student of ecology and conservation: both people you want to have on your team. And while this trip for me is an induction into more serious bushwalking – my sights now set on overnight hikes – for others in our group it is a gentler jaunt. With the relative luxuries of a B&B stay, meals provided, and our guides taking care of logistics, it’s a chance for the more experienced walkers to take their foot off the pedal and focus on the best bits. Once at the cape, we settle down near the edge to eat our sandwiches and soak in the awesome view: blue sea and sky on an epic scale, jagged dolerite columns rising from the waves that crash at their base. The next day, we find ourselves at the feet of these capes: riding the choppy waters on a white-knuckle cruise. It lends a different perspective to the sea cliffs and columns: it’s even more humbling to be in their shadow. 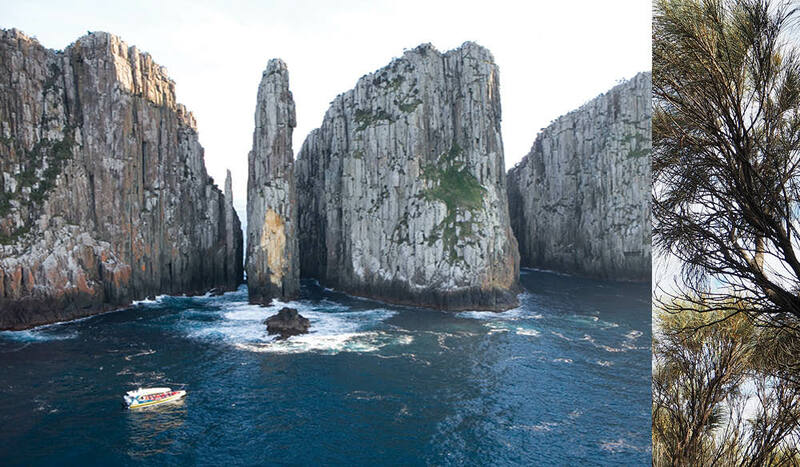 We buckle in to our jet-powered boat and set out on the three-hour Tasman Island wilderness cruise, heading for the highest vertical sea cliffs in the southern hemisphere at Cape Pillar that stretch 300-plus metres out of the water. The weather has turned moody and feels all the more appropriate for it. We dip in and out of archways and deep-sea caves and get buffeted by waves – the closer to the front of the boat you sit, the more ‘rollercoaster’ it feels. The waters today are considerably tame: on wild days, the swell in the Southern Ocean likely reaches around 18 metres (but don’t worry – in such extreme conditions, the boat would not venture out). 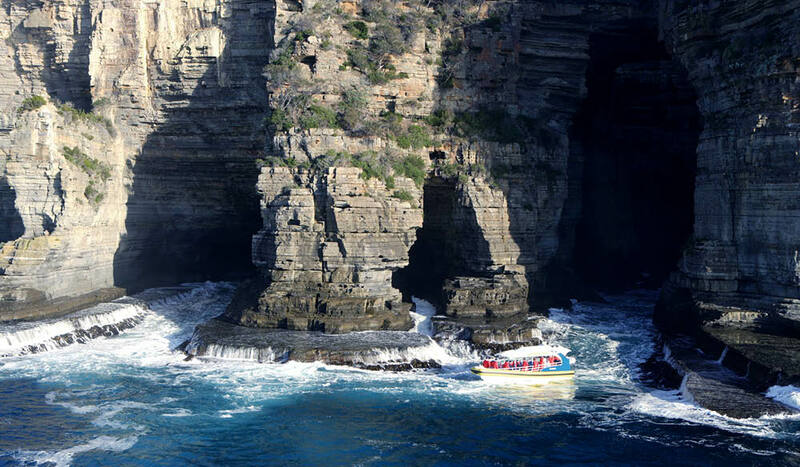 The cruise travels between Port Arthur and Eaglehawk Neck, and the exact route depends on the day’s weather and wind conditions. The waters are ripe for wildlife-spotting: albatross and sea eagles, diving gannets, cliff-nesting cormorants and peregrine falcons all populate the area. Today we see albatross and sea eagles, in addition to the colonies of Australian and New Zealand fur seals that live on the rocky shores of Tasman Island. We circumnavigate this small patch of land and steal a glimpse of the precipitously placed lighthouse and keepers’ cottages that once comprised one of Australia’s most isolated lightstations. 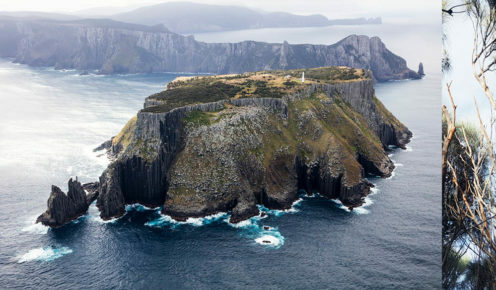 The lighthouse is automated today – still a beacon for seafarers entering Storm Bay, including those sailing the Sydney to Hobart Yacht Race – but the island has remained uninhabited since the last keeper moved off in 1977. 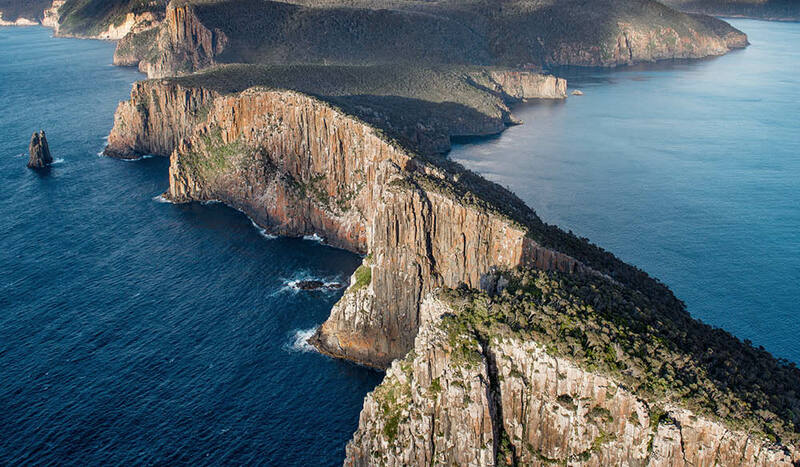 The Three Capes and Tasman Peninsula walk is a chance to feel Tasmania at its end-of-the-world wildest, without throwing yourself completely to the wind: maybe next time. After all, the more you walk the more you want to walk. And this in itself answered my earlier question. What is the point of climbing to the top of things? In this case, it was to hit that sweet spot: the home run back down the trail when the afternoon sun is soft and honeyed, the eucalyptus smells even sweeter and you don’t feel the pack on your shoulders anymore. One of the top seasons for whale watching, with various plant species in bloom, the coastal heath in flower, and typically sunny days. The warmest time to walk, with the most stable weather and longer daylight hours. Spectacular clear skies mean trekkers can enjoy the expansive views from the coastline. Also an ideal time to view the migrating whales off the coast, and autumn wildflowers add bursts of white, pink and yellow to the shrubbery along the track. The more effort you put into training in the time leading up to your trip, the more you will enjoy your experience. “Trek training is more than just walking,” Oscar Bedford, a Tasmania Expeditions guide, writes in the company’s comprehensive guide to getting ready. “It’s preparing the body for the increased intensity of undulation, terrain, pack weight, kilometres walked and overall endurance.” For an introductory to moderate walk such as the Three Capes and Tasman Peninsula, it’s recommended that trekkers have a reasonable degree of fitness and spend a couple of hours, a few times a week, doing some extended walking while carrying a daypack weighing five to seven kilograms. 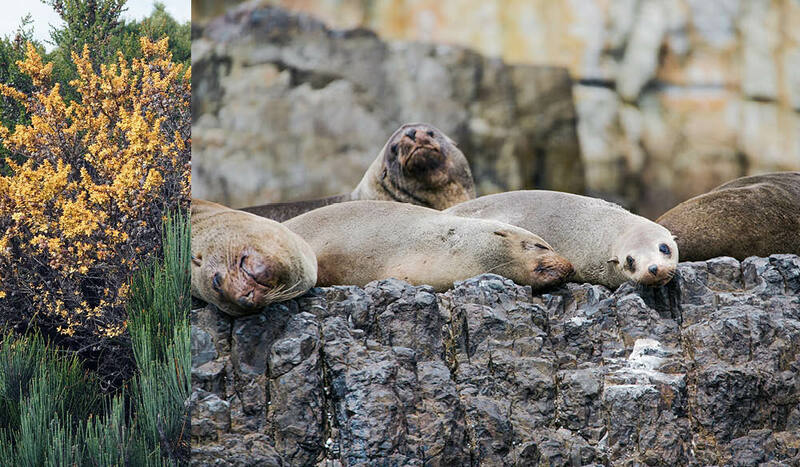 The Three Capes and Tasman Peninsula trip departs from and returns to Hobart. We preceded our walk with an overnight stay at Hobart’s The Old Woolstore Apartment Hotel; comfortable, converted heritage digs close to the city centre and waterfront. The walk is graded at level four (out of 10) which means you can expect introductory activity with several moderate stages. Training in advance is recommended (see break-out box). Tasmanian Expeditions has more than 30 years of experience in offering off-the-beaten track experiences in wilderness regions of great natural beauty, plus a commitment to sustainable travel practices. Our guides were passionate, knowledgeable, and the trip was well-researched and paced. Tasmanian Expeditions provides a detailed gear list for the walk and highlights the ‘layering principle’ – which is key to trekking in Tasmania. Essentials include lightweight walking boots (with ankle support), a quality waterproof jacket and pants and a small backpack (30-40 litres).